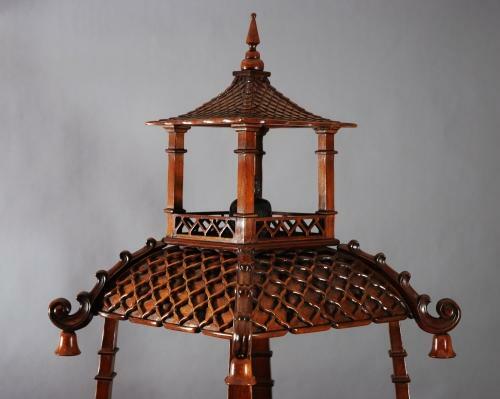 A decorative Chinese mahogany pagoda style four tier etagere with cabriole legs. The top of the piece has a four column pagoda leading down to a lattice shaped pagoda roof with scroll brackets & bells on each corner. This leads down to four shelf tiers, each with a pierced gallery with blind fretwork shelf supports. Underneath the shelves are carved fretted bracket decorations. Under the lower shelf is a mahogany lined drawer with blind fretwork decoration & a brass swan neck handle with a Chinese style pierced backplate. The piece is supported by four cabriole legs with stylised acanthus leaf carving leading to four paw feet. This is ideal as a stand alone piece or to display decorative items.